The U.S. 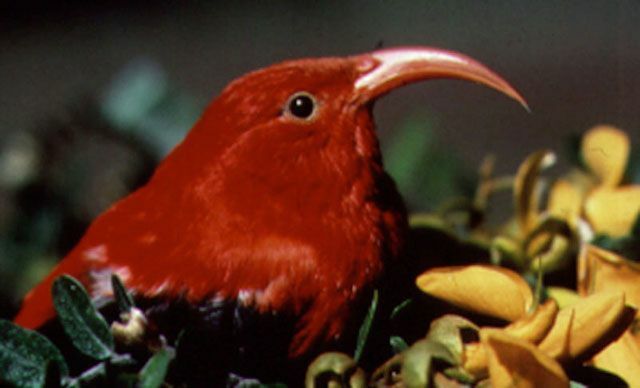 Fish and Wildlife Service listed the i’iwi, a native Hawaiian bird, as threatened after years of efforts by conservationists. (CN) – A Hawaiian bird, an Arizona mud turtle and a small Mississippi fish have been added to the federal List of Endangered and Threatened Species, following years of effort by an environmental group. The i’iwi, a Hawaiian honeycreeper, has been listed as a threatened species, the Sonoyta mud turtle has been listed as an endangered species, and the pearl darter has been listed as a threatened species under the Endangered Species Act (ESA). The Center for Biological Diversity petitioned the agency on behalf of all these species, and the group and its allies filed suit and won a settlement in 2011 on behalf of the darter and turtle and hundreds of other species that had languished in listing limbo for years beyond the statutory deadlines mandated by the ESA. The i’iwi, once common throughout all the major islands in the Hawaiian chain from sea level to tree line, is now found mostly on the Big Island and in smaller areas of Maui and Kauai in a narrow range between 4,000 and 6,000 feet elevation. The populations of these beautiful scarlet birds are being decimated by avian malaria brought to the islands by introduced mosquitoes. The island birds evolved in the absence of mosquitoes, and do not have immunity to the avian malaria they carry – killing 95 percent of the birds infected with it. The birds are driven to the higher elevations where it is cooler and there are fewer mosquitoes. The agency listed the birds as threatened, meaning it is in danger of extinction within the foreseeable future. This interpretation of this phrase differs from case to case. For the i’iwi, the agency foresees that the species may be reduced by 90 percent by 2100 due to the combination of disease, loss of its main nectar source due to disease, invasive species and climate change. In 2010, the center petitioned the agency on behalf of the birds but the so-called “90-day review” of the petition was not completed until 2012. The “12-month status review” and proposed listing rule were not published until September 2016, well beyond the timeframe outlined in the ESA. In the case of the turtle and darter, both have been candidates for listing since the 1990s, but further action was stalled due to other listing priorities. The center petitioned the agency in 2004 on behalf of the turtle, darter and 223 other plant and animal species, then joined with other conservation groups and sued when the service did not timely respond to the petitions. The 2011 multidistrict litigation settlement outlined a six-year timeline for the agency to address the backlog of species waiting for listing determinations. As that workplan wound down last year, the turtle and the darter finally made the cut and were proposed for listing. The Sonoyta mud turtle is an aquatic turtle that lives in an extremely arid environment. “Today, there are five known remaining populations of Sonoyta mud turtle – one at Quitobaquito Springs in Organ Pipe Cactus National Monument in Arizona and four in Sonora, Mexico. These populations occupy less than 20 percent of the subspecies’ historical range,” the agency said. Loss of habitat due to agriculture and municipal groundwater pumping and a long-term drought further stress these turtles by reducing available surface and subsurface moisture, reducing riparian plants that serve as shade needed for nesting and refuge for hatchlings and reduces prey. An interagency work group consisting of the National Park Service, the Arizona Game and Fish Department, private citizens and the U.S. Fish and Wildlife are focusing efforts on stabilizing water levels in the Quitobaquito Springs pond, where the most resilient population fights for its survival. An ESA listing of “endangered” means the species is in imminent danger of extinction. The pearl darter, a small fish less than three inches long, is no longer found in the Pearl River system for which it is named. Its range has been reduced by 57 percent, according to the listing proposal published last year. It “has been identified as a Species of Greatest Conservation Need in both the Louisiana Wildlife Action Plan and the Mississippi Comprehensive Wildlife Conservation Strategy,” the agency noted. It faces huge threats due to land development, agriculture, oil and gas development, inadequate sewage treatment, pulp mill effluent and watercourse changes from dams and sills. The agency determined this species is not in immediate risk of extinction, so listed it as a threatened species. However, the “foreseeable future” has been assessed for this species as 20 years, in part because climate change may increase the severity of weather events that could wipe out the small and highly fragmented populations. Critical habitat has not yet been designated for any of these species. The agency has one year to analyze appropriate areas and needs of the species and evaluate the economic costs of making critical habitat determinations. The final listings are effective 30 days from the expected publication date of Sept. 20, 2017.